Words cannot express the frustration of loving something so much, and then the futility of not being able to find it ANYWHERE. Which is exactly what I experienced with THIS coat from River Island. ... Because I couldn't find the damn thing any where. I was ready to give up. Or at least maybe consider contacting River Island to enquire if the coat was in fact real or if it was about as mythical as a unicorn. Then yesterday morning I struck gold. I went onto the website and found it in the New In section. 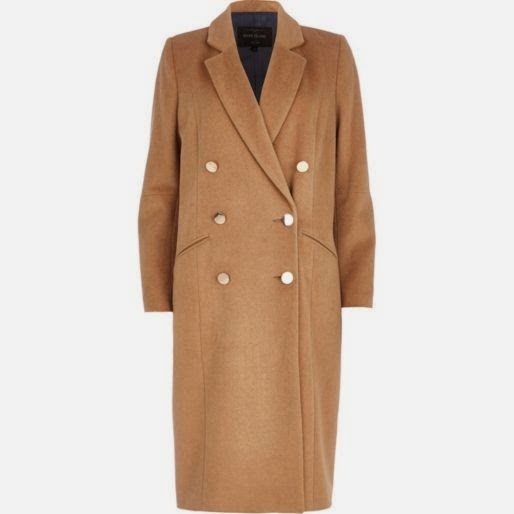 At £110, it isn't the cheapest of coats on the British high street - but it's well worth the investment as it's a timeless piece that I will get so much wear out of over the years. After work I swiftly went online and snapped one up sooner than you can say "camel". FINALLY a camel coat that hasn't sold out before I've managed to get my mitts on it! REVELATION. Have you bought into the sandy coloured coat trend yet? I am the most pickiest person when it comes to winter coats. I always pick something that has pockets and can fit thick wooly jumpers underneath. I'm not sure if I would pick this only because it feels so grown up to me but it really does look nice on all the models. I bought the River Island coat, and wore it once. I now no longer want to. You can buy mine for £95 if you want it.